The CoffeeShop Blog: CoffeeShop Instant ColorBar Photoshop/PSE Action! CoffeeShop Instant ColorBar Photoshop/PSE Action! I love using color palettes for design inspiration. 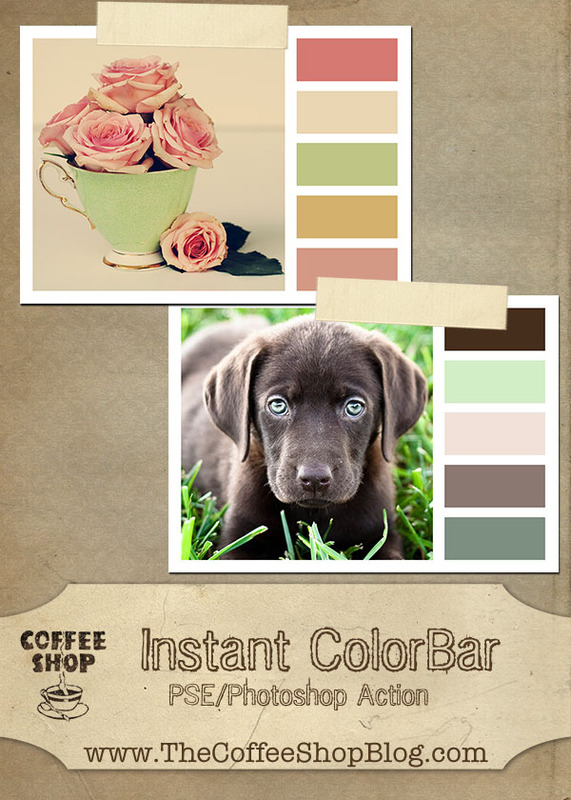 It all started when I discovered the beautiful photography and color palettes at Design Seeds and decided to create and share my own layered ColorBar templates. I have had quite a few readers ask me what you are supposed to do with them. Other than creating really cool looking storyboards from your favorite images, they are also a brilliant way to pick colors for all types of design. I use them to pick colors for website/blog design, logos, storyboards and even to select colors for rooms in my house. Open any image and select colors out of it and you can use one color to paint your walls, one for pillows, and one for a rug. If you are a quilt designer it would be a neat way to pick fabric colors that look great together. 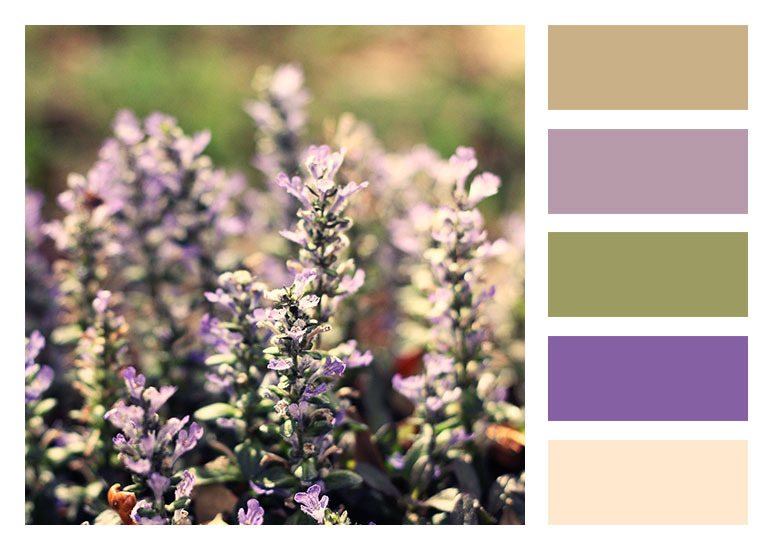 I am sure you can think of many ways to use these nifty little color palettes and they are fun to make. However, I love using actions whenever possible to save time, so I wrote the CoffeeShop Instant ColorBar action to make it simple to create custom colorbar palettes in under a minute. For some inspiration ways to use these colorbars to document your baby's first year, please click here! 1. If you are new to actions, you can find instructions on loading them on my Action Install page. I like to capture colors with the eyedropper using the 3 by 3 average setting rather than point sample. 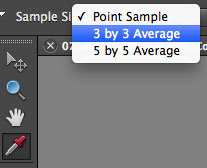 To set this as your standard setting, click on the eye dropper tool (I) and then select "3 by 3 Average". 2. Open the image and make sure it is a 8 bit flattened jpg and start the action. Crop bars will come up, so drag them to taste. If you can't see them completely, click Ctrl-0 (zero) to zoom out (use Ctrl-0 again to zoom in). 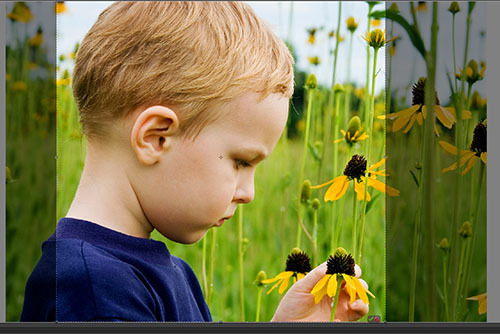 Once you are happy with the crop, click on the check on the bottom in PSE or the check on top in Photoshop. 3. The action will crop the image and add a white canvas and 5 gray squares. The "Pick a solid color" pane will come up, so simply click on a color in the image you wish to capture and click OK. Don't get too particular at this step, you can always change the colors at the end of the action. 4. The "Pick a solid color" pane will come up four more times, so each time click on the image to capture a color and Click OK.
5. 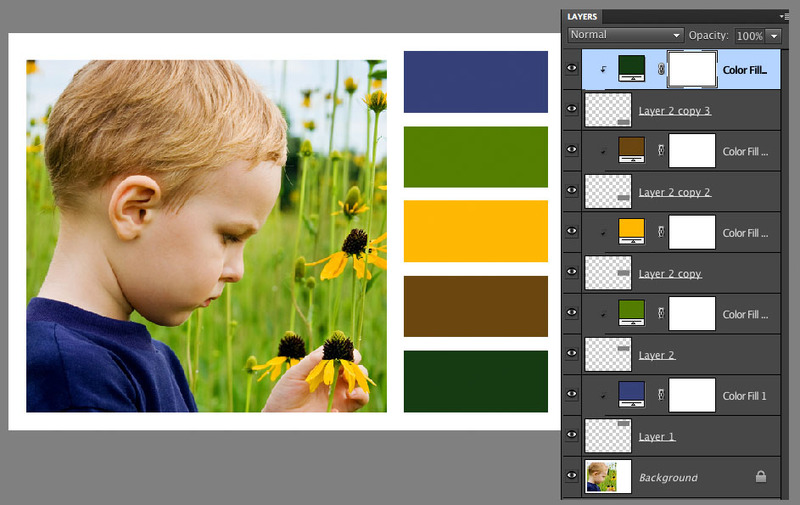 Once the action is finished, you will see all of the layers and color fill adjustment boxes. If you want to change any of the colors, click to select the little color box in the layer pane and then click on your image. Easy, right? I hope you have as much fun with this action as I do! Download the free CoffeeShop Instant ColorBar action for Photoshop and Photoshop Elements! You can also download the action on here. Want all of my favorite CoffeeShop Actions or Design Elements in one simple download AND help support this blog? Just click here for my action pack (includes this action!) or here for a download of some of my most popular design elements, storyboards, and textures. For complete instructions on installing all of my actions, click here. Awesome action! Thanks so much! Thank you! I can't wait to play with this! Thanks! This is a fun one! I'm an interior decorator, so I can see myself making palettes from existing interiors with this tool. I like it! Oh, thank you so much! As a scrapbooker I am super excited to use this one! Rita thankyou so much for the action. I have a colorbar meme each Monday and some of my readers have been having difficulty knowing how to make them. This little tutorial will be very useful for them. Thank you so much for this post. I want to let you know that I posted a link to your blog in CBH Digital Scrapbooking Freebies, under the Page 4 post on Jan. 29, 2012. Thanks again. Thank you so much for this post. I want to let you know that I posted a link to your blog in CBH Digital Scrapbooking Freebies, under the Page 3 post on Jan. 29, 2012. Thanks again. This looks like so much fun! Thank you for sharing!!! to work with and learn. It's like going to school.. Thanks Rita! This will be perfect for those digital scrapbook pages. Thank you so much! I love it! I think it it helps me look at the picture in a new way paying closer attention the the colors. This is awesome! Thank you so much for all your goodies, I use them all the time and always credit you on my blog. You're the best! thanks for this action.. though it is not working for me? I have elements 9 and how do i make a 8 bit flat jpg, it does not give me that option to? What a fun action Rita, thank you so much!!! LOVE, Love, triple love this! Thanks so much for sharing! This really is amazing and so so easy! It's so much fun just watching while the action does all the work. Amazing. Thanks for all the awesome goodies that you have here. Thank you ! These are great, can't wait to try it out. Alright! LOL Now, if you could just create an action that would choose the color palette for us! You are absolutely the best! Thank you, Thank you!!! So much fun Rita, love this! Thank you so much for sharing another awesome action for us to play with. Thank you for your awesome actions, I love this one! Thanks for the awesome action!!! Awesome! I'm pretty much obsessed :) Thank you!! Rita, Thank you for responding. Not sure how to do this, but when I open my jpg, it is already flattened- even looked on the toolbar to make sure it wasn't an option. Then under mode, 8 bit is grayed out so I assume it is 8 bit, whatever that is!! But it gives me just a narrow vertical strip for the entire picture after I run the action. This is really great! Thank you so much for sharing this amazing action. Rita, this is awesome! Just what I needed to show clients a background color samples chart for studio portraits. Thanks so much! This a great tool for doing a stroke (colored border)on a photo. I always have tough time choosing a color from the photo to make the stroke. This action really helps eliminat a lot of trial and error in selecting a color. What a fab action! Thanks so much. Also thanks for the tip on using a 3x3 sample for picking colours. I have changed my setting and will have to try it out. Hi Rita -- Here's a random question from an older offering. I downloaded both your color bar actions and am using PS CC. For some reason, not all the steps are available and I get a red check mark on some of the action steps. I even tried deleting and reloading. Any ideas? I love these actions and wanted to use them in a project. Thanks and Happy Holidays!